The Value of Getting Uncomfortable - SparkFire, Inc.
Our family just returned from a two-week vacation rafting through the Grand Canyon. 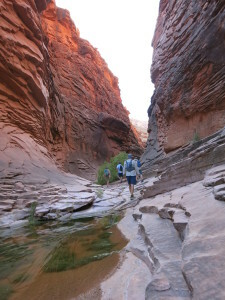 The majestic river, desert hiking, and unplugged atmosphere were superb. When asked about his trip, my thirteen-year-old son said, “It was awesome.” With a twinkle in his eye he continued, “I did the most things that made me uncomfortable of any trip that I’ve taken.” This came from a boy who’s biked through remote villages in Tanzania, climbed to 17,000 feet on Mt. Kilimanjaro, hiked through the Swiss Alps, and kayaked with sea lions and whales. Throughout the trip, he didn’t resist challenge (never a complaint), didn’t worry about outcomes (at least he didn’t voice them), and seemed to instinctually move toward things that were a little uncomfortable to him. While he was reluctant to go through the legendary rapids, he held on tight and celebrated success. During our numerous hikes through side canyons, he rose to the challenge of scrambling up rock and negotiating big exposure. 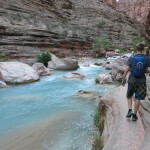 He even got up at 4:30am to do the challenge hike to Havasu Falls to see the turquoise water rush whimsically through the canyon. While somewhat scared of heights, he jumped off cliffs into the flowing river and into pools below falls, beaming with excitement with each accomplishment. During our silent group hike through a mystical canyon, he sat down, took his flute out of his backpack (our guide suggested he bring it along) and played (despite being shy about playing in public); the melodic sound reverberated off the walls and into my heart. I hadn’t imagined how much pleasure, and growth, this trip would provide my son. I simply thought it would be a great family adventure in an over-the-top beautiful environment. To my delight, he seemed to walk away with a new level of confidence by choosing to challenge himself at every turn. He reminded me of something – the value of getting uncomfortable. If we put ourselves in environments that make us a little uncomfortable, and we are open to what happens, growth will likely occur. Adventure is a catalyst for growth. I have to admit, with little experience whitewater rafting, I was a bit apprehensive about the rapids we’d experience in the Grand Canyon. And just like my son, I made it through with a beaming smile, and a feeling that I’d stretched myself in a new way. While my family is accustomed to the life of remote camping, some rafters on our trip were adapting to two week of sleeping on the ground, washing in a muddy river, intense heat, fine sand infiltrating everything, and the communal aspect of living in the wilderness with a group. These things also provided opportunities to be uncomfortable, and to grow. Now that I’m back home, with all the many comforts, I hold tight to the gifts from being uncomfortable in the great canyon.